Leading indian online shopping portal Amazon conducting annual sales , as a part of the promotions star maa channel airing amazon great indian festival event. 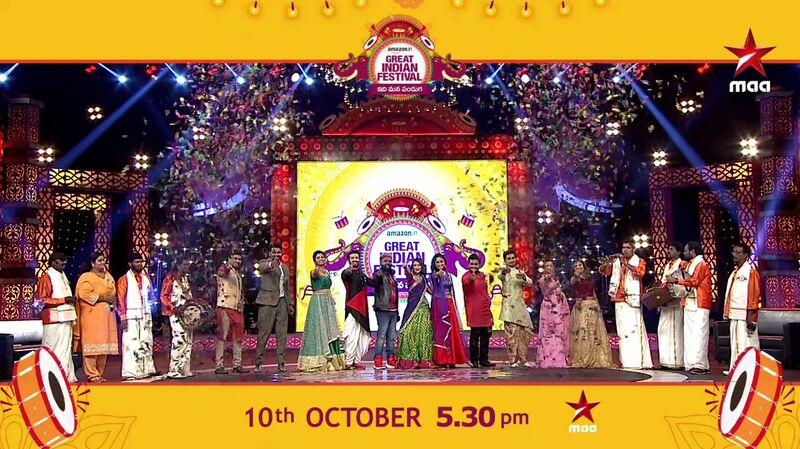 10th october 2018 at 5.30 p.m is the telecast timing of this telugu festival show. Offers already started for prime members now, click here for getting special price while you shopping online. if you are a prime user of amazon you can now start shopping with great offers. 10% Cashback on Select Cards, EMI & Exchange Offers, Exclusive products etc are some of the highlights of this sale. Maa tv is the leading telugu general entertainment channel and showing the event. Selected dress items getting upo 50% off, you will again get cash back for some debit or credit cards. This indian online shopping portal doing huge promotions for the annual shopping festival. Now online purchase is very common among Indian’s, all are looking for special price, cash back, earnings etc while purchasing. Subscribe to prime membership now is a great option, you will get early access to the promotions. prime members getting some other privileges like free shipping for products etc. easy returns, pay on delivery etc are some of the other features of online shopping. Special day price is applicable for categories Electronics, Clothing & Accessories, Appliances, Books, Furniture, Groceries etc. 50%-80% off on Fashion, Upto 40% Off on Mobiles, Upto 55% off Electronics. LED TV, mobile phones, kitchen appliances, home accessories can be purchase at great price.